"The Next Age: Chapter Three"
Maxine and Stargirl go through costumes, and Maxine eventually decides to become "Cyclone." The Fourth Reich decimates Commander Steel's family. Reichsmark attacks Nate, who stabs him in the mouth with a crutch. Reichsmark bleeds on him, knocking him out. Hawkman fails to save the family, and the Fourth Reich retreats. Only Nate survives. Hawkman takes him to Dr. Mid-Nite. Wildcat tells his son about his first son, who died at the hands of a villain. They agree to leave each other alone. Wildcat just wants to stay for the rest of his beer. The Sandman appears and tells the heroes that patriotic figures are having their families attacked. The next targets appear to be Stripe and the original Liberty Belle. The team splits up to save the two families. Dr. Mid-Nite finds the object in Mr. America to be an arrowhead. Wildcat, leaving, is smashed into unconsciousness by a fist. Vandal Savage's fist. His son, realizing the danger, morphs into a were-wolf style Wildcat, much like his father, only superpowered. 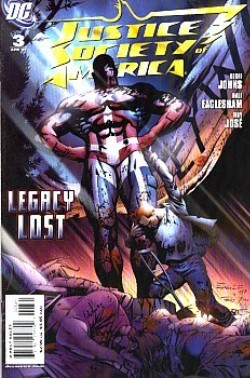 Story - 4: Welcome, everyone, to the JSA reviews! The last two are available HERE and HERE, if you want to take a look. We just figured, since this series was gonna involve Supes and Power Girl and since the book just plain rocked, reviews would be a good thing. Nice little twist at the end, and a great fight with the Fourth Reich. Stabbing someone in the mouth with a crutch and having Nazis running through little girls is harsh, but there's no CCA on this book, so it's fine and great and fun by me. It's easy to hate Nazis, and even better to see Hawkman smashing them senseless. The peril is real, in that they succeed, and Nate is an intriguing character. He's obviously going to have some kind of power, it would seem, but it's still a neat addition. My knock of a point is because I don't really understand why the heck Vandal Savage would concern himself with killing the families of patriotic heroes when there are more direct ways to cause a war through subterfuge, his MO. I'm guessing, however, that future issues will make this sensible, and therefore give it the benefit of the doubt, knowing Johns. When it's resolved, consider the above a five. Art - 5: Check out that "Split up" page. Awesome. And it's hard not to make flying through a little girl and her mother either comical or horrific, stopping the story. Here, somehow it works. That's good art. And very weird of me to say. I like the new Wildcat, neat design. And Cyclone also, very realistic as opposed to idealized, and a lot of fun. 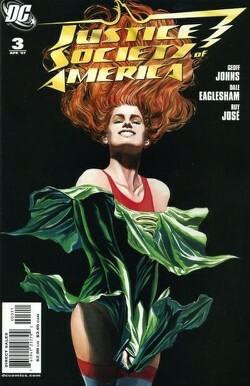 Cover Art - 5: As I said in the last reviews, single character covers are getting a bit old to me, but then, it depends on the character, too, and this image symbolizes a great character leap in this issue, along with making an image that, because of the wind and the pose, are really remarkable. It's a great exception.